How charming is this? I found this in my daily Shelf Awareness for Readers email. 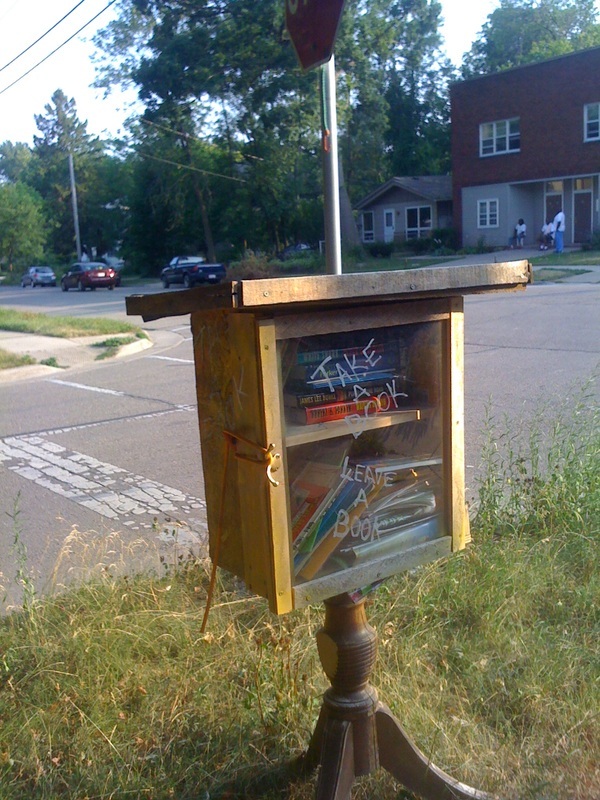 Imagine finding a lending library in your local park, grocery store parking lot--or even at the end of your street. Little Free Libraries, the brainchild of two Wisconsin entrepreneurs, are tiny, freestanding containers that can hold a small number of books, anywhere from five to two dozen volumes. Each Little Free Library can be slightly different. Todd Bol and Rick Brooks designed the first one to look like an old-fashioned one-room schoolhouse. Dedicated to Bol's mother, it is located just a few blocks from the Hudson, Wis., riverfront. But while the actual libraries are so cute they're almost twee, they have a very serious purpose behind them. The men want to help communities worldwide increase access to books, raise literacy--and surpass famed magnate Andrew Carnegie's record of building 2,509 free libraries. On their site, Bol and Brooks not only sell plans so that you can build your own Little Free Library, but offer premade models and sponsorship opportunities, as well.